So you don’t want to race? Recently I’ve heard a number of people say that they’re not interested in taking part in races with their dog. Reasons for this seem to be related to people feeling they will be too slow, not knowing how their dogs will react to a race situation or just not feeling that they want to travel for a race which might be less distance than they run at home. All of these things I can understand but I would like to use this blog to encourage people to come along to a race and have a go. I personally never thought in a million years I would enjoy racing. I’ve never considered myself a runner and I hadn’t been on a bike since I was about 8 years old, so if you’d told me before I started all this that I’d be competing in European Championship canicross and bikejor events, I would have laughed in your face. It was a friend of mine who mentioned the canicross racing to me and suggested that I should give it a go, in her words she described it as ‘wonderful madness’ and I liked the sound of that, so signed myself up. Of course I didn’t go to a race without having done some training first. I’d been running with my dogs for a few months before I entered my first race and I was pretty nervous about what to expect, not having been in a running race since I was in school. The whole process was very laid back and put me at ease right from the start, with plenty of information about rules on the website when I entered and the race organisers holding a briefing for runners to explain how the race would be run. Nothing could have prepared me for the start line however! The sound of close to 100 dogs all excited and all raring to go is quite something to behold. At this point I’d like to reassure anyone who is thinking about racing, the dogs are generally all kept a good distance apart, with runners understanding that in situations like this the dogs’ excitement can lead to unwanted behaviours such as lunging, therefore the focus of the runners is always on the dogs. The race itself (once you are off the start line) is generally very quiet and all you hear is the sounds of the dogs panting and runners or bikers puffing hard in their efforts. The odd directional command for the dog or warning to another competitor is all you should hear when you’re out on the trail unless you choose to start up a conversation with another runner (which has been known to happen in my case!). One of my concerns was how my reactive dog would handle a situation in which lots of other dogs would be passing shoulder to shoulder, and knowing that I’m not a very quick runner, I knew there would be plenty of people overtaking me. What I found was that as long as I kept her under control at the start and just asked people to give me space when overtaking, that she has learned to accept other dogs passing very closely and in fact is focused on her ‘job’ and will run happily alongside dogs she would not tolerate standing with under normal circumstances. I have now competed in well over 100 races and can honestly say I don’t take part for the prizes or the thrill of the race. I enter races to see new parts of the country, to run on trails I would otherwise never know to explore and also to meet up with the many like-minded friends I have made over the years. 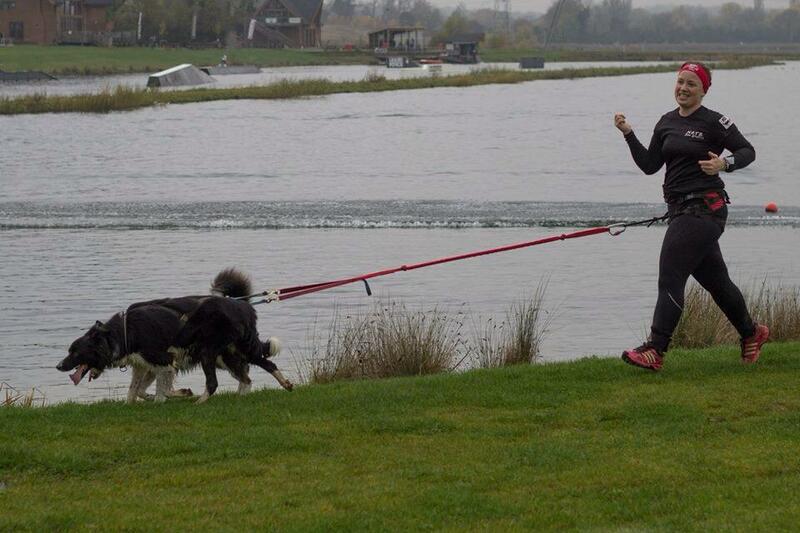 For me however, the main reason I race is the fun the dogs have when they are out doing the activities they love. It makes me so happy to see them excited and and also how relaxed they are and how well they sleep after a weekend away socialising and racing with friends. The dogs may enjoy some of the prizes but they aren’t bothered by the rosettes, medals and trophies! 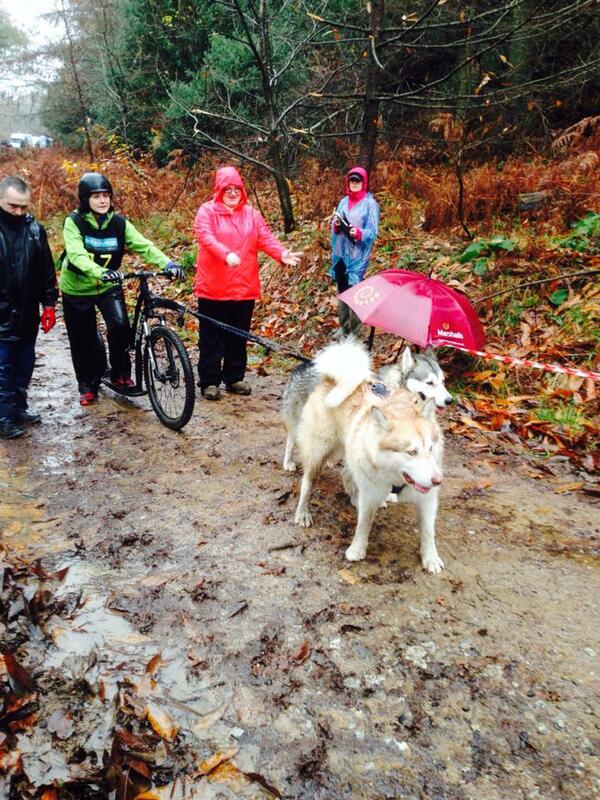 So if you are considering taking part in a canicross or bikejor race, my advice would be to go for it, if you don’t like it, you haven’t lost anything except the cost of a race weekend and if you do like it, you may just open up a whole new world of fun and friendship for both you and your dog. Happy trails and hope to see you at an event soon! For the next instalment of my race reviews, I decided to combine November and December because I ended up only going to one event in December. The first event of November was the Mad Dog Jog, Forest of Dean, 2nd November – A very friendly and welcoming event run by members of the Forest of Dean canicross group. 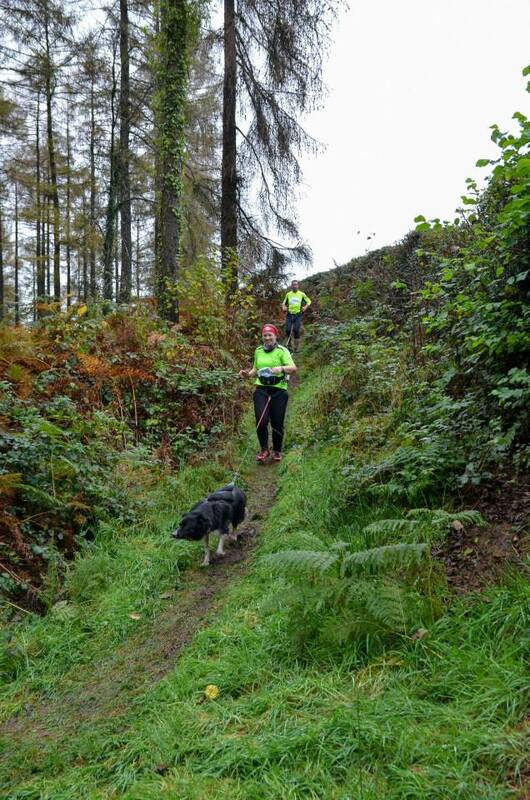 This was a canicross race with a difference, as the course was a challenging, twisty, turning route through part of the Forest of Dean with many ditches, tree roots and hills to keep us occupied. I had decided to run this with just one dog, as I had prior warning of the nature of the course! We had a great run and I laughed my way round the course and across the finish line, where I was handed my finishers medal but none other then Eddie ‘The Eagle’ Edwards. We also enjoyed the special goody bags which contained a vast array of goodies for both me and Judo to enjoy. The following weekend we made our way up to the Canicross Midlands / Adams Agility Race Series 1, Eland Lodge Derbyshire, 8th & 9th November – this was another brand new venue for a race series which promises to provide a challenge for many competitors throughout the 4 race weekends being held here. The course includes 3 water crossings, two man-made horse jumps (the route winds it’s way around a large equestrian cross country course) and one natural river crossing. Although, the race is set in just a few fields, it provided a mix of hills, straights, grass and mud that made it tough enough for even seasoned racers whilst managing to be suitable for the novice entrants who have their own classes in this series. I competed in both the bikejor and two dog canicross classes, with Donnie running so well in the bikejor, we even managed to come away with a second place trophy. We were back up the country again for the Box End Collie Wobbler in Bedfordshire on the 15th November – Held at the Box End Park, this was the second race we had been to at the venue and yet again we thoroughly enjoyed the atmosphere. The course, which flows around the central lakes and then off up into an area of small hills and single track, all on grassy trails, was just as fun the second time round. We participated in both the bikejor and canicross classes, getting some unusual prizes for taking part, which included a bottle of wine, some electrolyte tablets and a technical t-shirt. 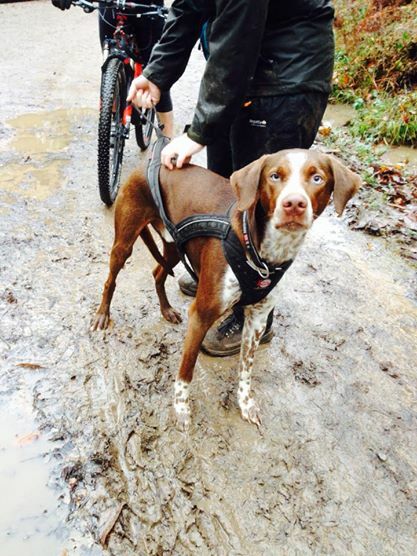 The next day we were racing just up the road at the Stowe Park Pace Setter on the 16th November – This was a new venue for a canicross event and the timings dictated by the National Trust meant that only one class entry was possible per competitor, so we chose bikejor. The course was all on hard packed paths and incorporated one of the estate roads too, so although it was an easy trail, the terrain wasn’t ideal for a dog sport race. We had a good run and enjoyed seeing the different parts of the park (Donnie even got to take a mid-race drink from an ornamental fountain!). In spite of the fog it was easy to appreciate the beauty of the setting. Prizes were given over a wide range of classes but only for first place, so I’m not even sure where we finished but it seems that all who took part agreed that Stowe Park was a unique and charming venue. 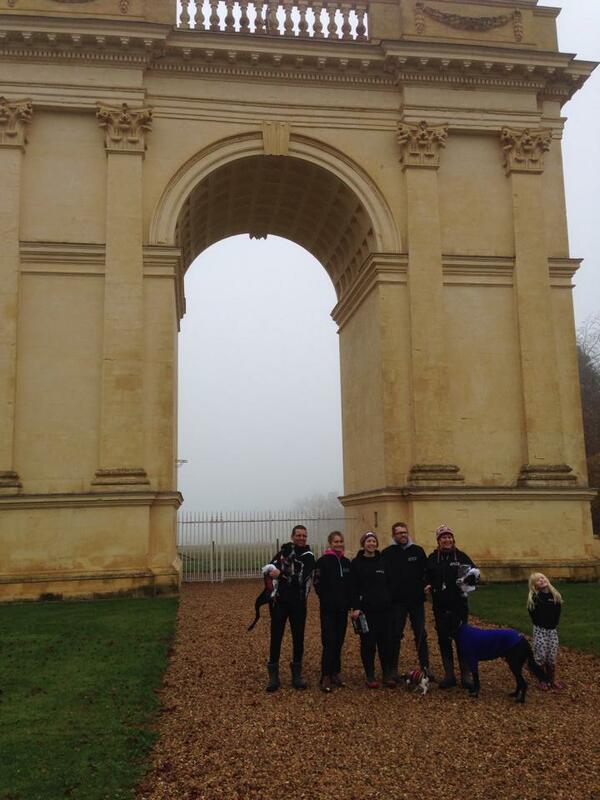 The large arch at the start of the race at Stowe park was just one of the impressive sights we saw on the course. After two really good runs for both myself and my team mate, we came home with a second place, only beaten by the team who had the fastest time over the whole weekend, so a great achievement! On to our only December event the Wyedean East Mushing / UCSC Event, Thetford Forest, 27th & 28th December – We made our way across the country to this one on Boxing Day and set up for the weekend in the beautiful Thetford Forest. All three dogs were entered in their own classes, two in the bikejor and one in the canicross, so we were all kept busy at this event. The course consisted of long, wide, grassy trails with only the merest hint of a hill, which suited us just fine! 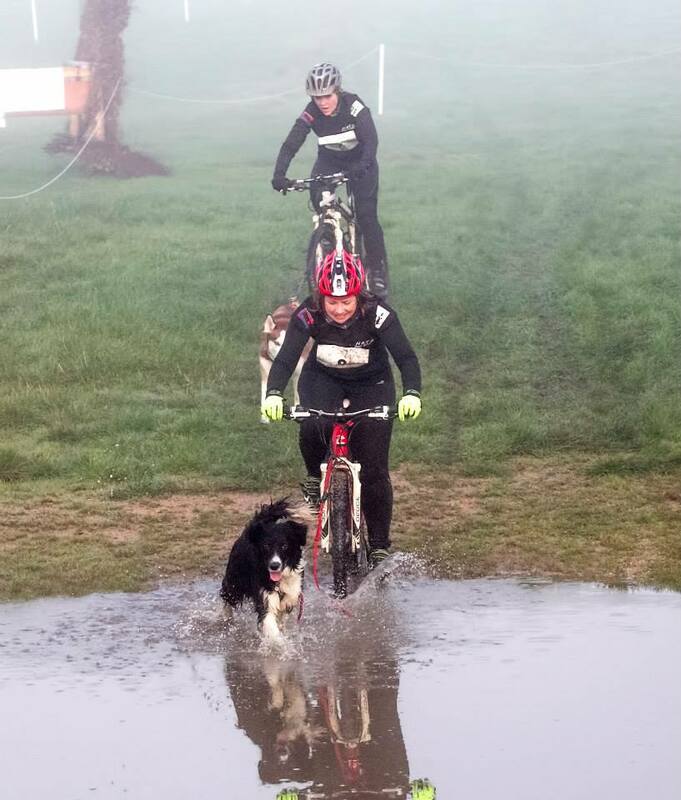 We had good runs both days, in spite of the non-stop rain on the Saturday, but nothing quick enough to get any of us into one of the top spots as both the bikejor and canicross were male and female combined. 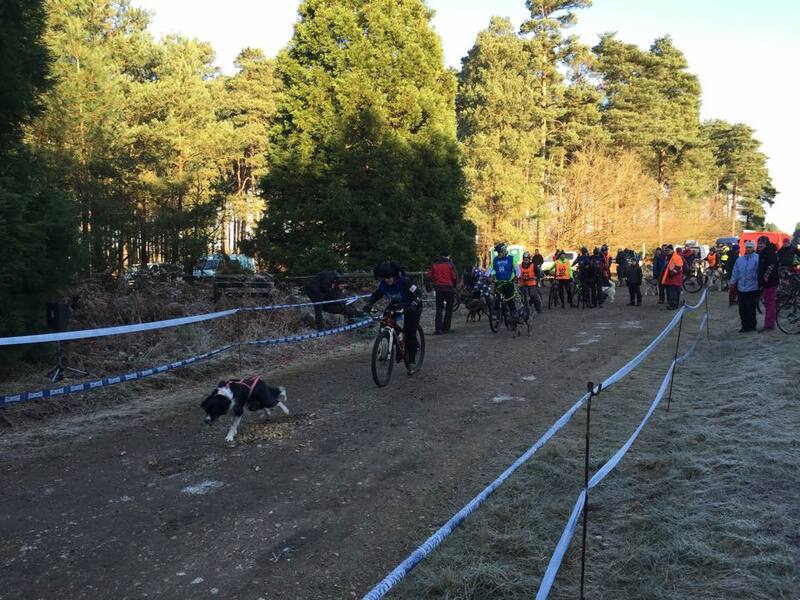 The Wyedean East Mushing event was well worth the journey to Thetford forest for the great racing weekend. To sum up, we had a manically busy November and needed a bit of a rest to recover in December but the events we attended just seem to get bigger and better, with more entries and even more open classes now. I think 2015 is going to be the best year for racing in the UK yet, with so many new clubs organising races and the established clubs gaining entries from the rapidly growing disciplines of canicross and bikejor.